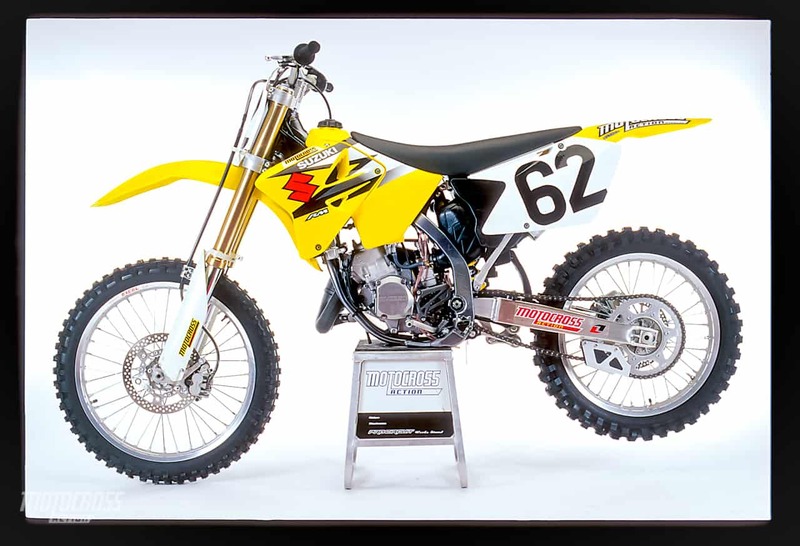 This test was pulled from the MXA archives out of the 2004 March issue. Is something missing? Are we forgetting something? There is no denying that 2004 has been the year of the 250cc four-stroke. With three, all-new, mid-size thumpers released to enthusiastic consumers, what got lost in the shuffle? Two-strokes! It seems as though the world has lost interest in 125cc two-strokes. Big mistake, because, despite what you may think, they can run with the 250 four-strokes and, as the AMA 125 Nationals proved, beat them. The 125s have gone to the back burner faster than Linda Blair can check traffic behind her (without a rear view mirror). As technology marches forward, no one wants to get left behind. With four-strokes all the rage, it seems so ‘80s to be a tiddler pilot (riding a ring-ding). To the next generation of 125 class riders, being on a true-to-life 125 just isn’t cutting edge. Is this mindset wrong? It could be. This year’s crop of 125s is the best we’ve ever seen. To find out which 125 two-stroke is number one, the MXA wrecking crew rounded up the five prime contenders and put them through their paces. Here is what we have learned about the 2004 tiddlers (say it proudly). 2004 KTM 125SX had the broadest powerband. A: KTM. Without a shadow of a doubt. The KTM 125SX comes on early, pulls hard through the middle and revs long enough to get you to the next corner. Even better, after you dent the stock pipe, get a Pro Circuit pipe and you’ll get enough extra rev to make the competition disappear in your rear view mirror (unless you’re Linda Blair). Q: WHICH ONE HAS THE MOST SURPRISING POWERBAND? A: Kawasaki. 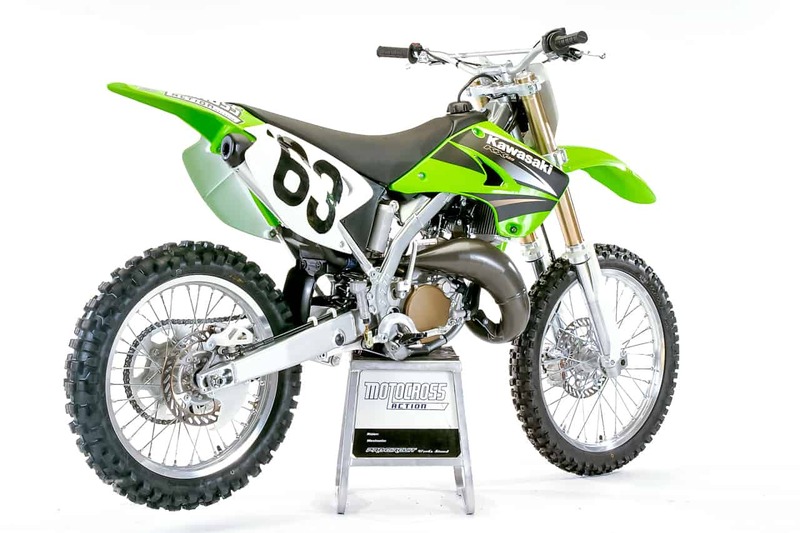 After years of bottom dwelling, the KX125 came out swinging in 2004. It made a major powerband jump, both on the dyno and on the track. A: Honda. But don’t think that we are picking on the 2004 CR125. The 2004 CR engine has been improved over Honda’s last few efforts, but it takes all the skill a rider has to keep it in the meat of its narrow mid-and-up powerband. On the dyno, the Honda makes the least horsepower in the 125 class (it is four horsepower down to the class leaders). 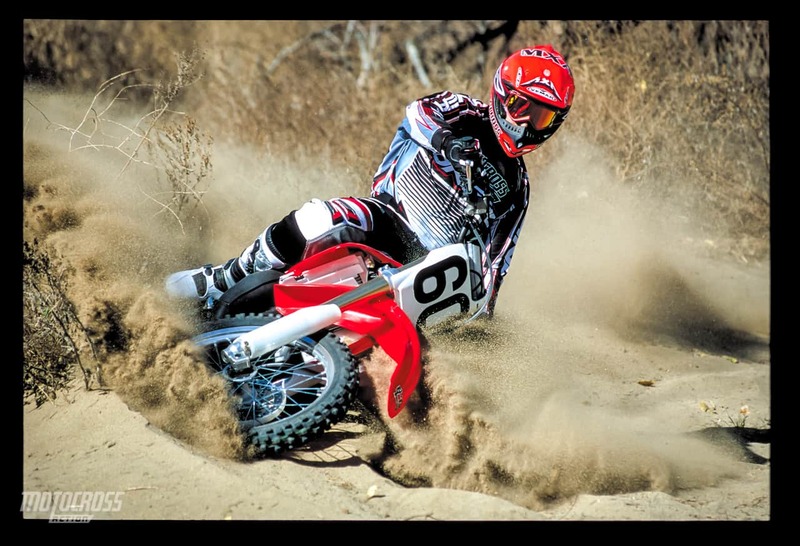 The 2004 Honda CR125 had the worst powerband that year. Q: WHICH ONE HAS THE BEST OVERALL POWERBAND? A: KTM. Making a 125 go fast is more about keeping the engine in the meat of the powerband than living on the fringes. From Beginner to Pro, the 2004 KTM 125SX is the fastest, broadest and easiest to use. A: How do the five 125 two-stroke engines rate in the hierarchy of power? (1) KTM rules the roost and is pretty much in a class by itself. (2) The Yamaha YZ125 comes in second with a powerband that’s both fast and responsive. (3) Kawasaki’s KX125 garners a close third, thanks to tons of horsepower. (4) The Suzuki RM125 gets fourth based on its screaming high rpm rev alone, but it could use more low-to-mid. (5) Honda’s CR125 gets fifth because, unlike with the others, you must keep your fingers on the clutch at all times or risk falling off the pipe. A: Honda. The Honda CR125 uses Kayaba components, even though the CR250, CRF250 and CRF450 come with Showa. The choice of Kayaba for the CR125 is smart marketing. Unlike Yamaha and Kawasaki, who spec 48mm Kayaba forks, Honda stuck with their tried-and-true 46mm Kayabas. The result? Perfection (and proof that the outside diameter of the fork isn’t as important as what’s inside). A: Honda. It doesn’t matter how fast you are or how much you weigh, Honda’s rear suspension stands out. Q: WHICH BIKE HAS THE BEST OVERALL SUSPENSION? A: Honda. How do the other four tiddlers rank? Yamaha second, Suzuki third, KTM fourth and Kawasaki fifth. In the time before KTM ruled the braking world. The RM125 had the best brakes in 2004. A: Suzuki. This category has gotten tight in recent years. Honda used to rule it, but with Suzuki, Kawasaki and KTM all sporting ultra-powerful front brakes (not to mention CR-style brake routing) the choice is no longer clear cut. Suzuki got the nod because it has a nice balanced package (front and rear). Honda lost because their rear brake overheats. KTM has an awesome front brake, but their rear gets chirpy, just like the CR rear brake. Kawasaki and Yamaha don’t have the pucker power of the other bikes. A: Suzuki. As a rule, the MXA wrecking crew has been disappointed with the new crop of five-speed trannies in the 125 class. 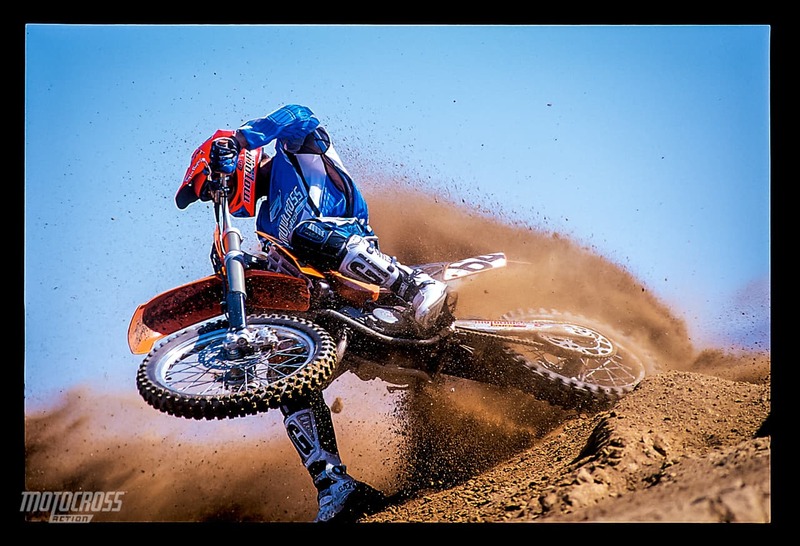 Yes, Virginia, we know that most riders rarely use sixth gear, but we also know that when Yamaha, Honda and KTM switched to five-speeds, their gear ratios suffered (and so did their shifting). Suzuki and Kawasaki are the last bastions of six-speed cogboxes, and the RM125’s sixer is better than the KX125s (especially when it comes to lever shape and position). A: KTM. The Austrians are the last manufacturers to use undercut dogs. Why do they do this? Undercut dogs are more secure and rarely pop out of gear. The tradeoff is that they are harder to shift under a load. The Kawasaki KX125 had the worst clutch. A: KTM. It isn’t 125 racing if you aren’t fanning the clutch. And when it comes to hammering the lever, KTM’s hydraulic clutch doesn’t break a sweat. It is well modulated and self adjusting. A: Kawasaki. 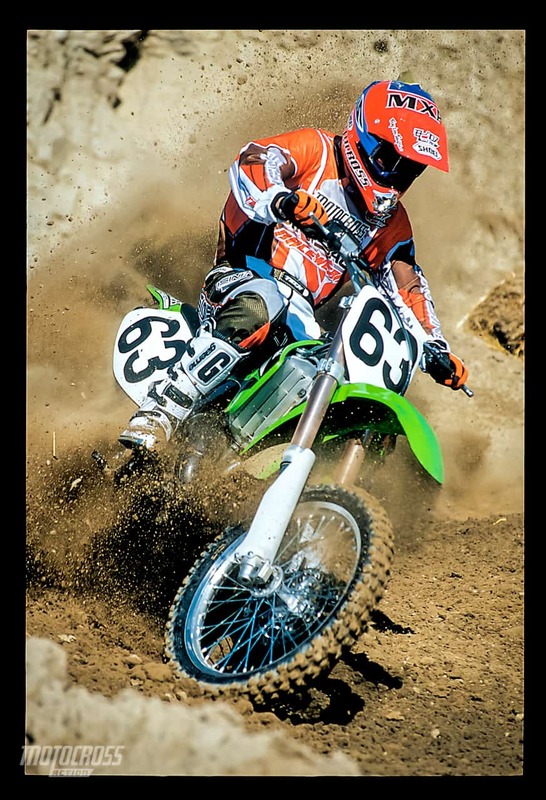 The KX125 is the only brand that doesn’t come stock with an on-the-fly clutch adjuster. Q: WHICH BIKE TAKES ABUSE THE BEST? A: KTM. Nothing gets this machine down. Months down the road, the KTM’s plastic still looks sharp, the paint on the frame hasn’t worn off and the shroud graphics are intact. The 2004 Yamaha YZ125 looked the worst after hours were put on it due the weathered look of the blue plastics. Q: WHICH BIKE TAKES ABUSE THE WORST? A: Yamaha. We blame the weathered look on the blue plastic. It shows every scratch, fades in sunlight and gets white creases in it after crashes. Yellow, green, orange and red don’t show the abuse as much. A: Honda and KTM. Both come stock with Renthal aluminum bars. Honda chose to go with regular-size bars and KTM chose oversized bars. Pick your poison. 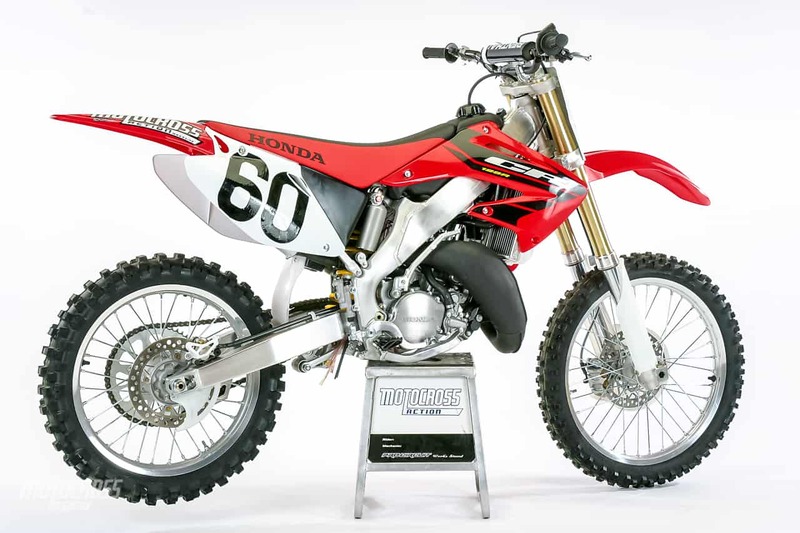 The Honda CR125 coulda, shoulda and woulda won MXA’s 2004 125 two-stroke shootout. Hardpack: Yamaha, Kawasaki and Suzuki opted for hard-to-intermediate terrain with Dunlop’s K739 combo. Soft terrain: KTM went for soft terrain tires with its old-school, but worthy, Bridgestone M59/M70 tires. Q: WHICH BIKE HAS THE WORST TIRES? A: None of them. Several 250s come with Bridgestone’s less-than-loved 601/602 combination, but all the 125s have tires that the MXA wrecking crew can live with. A: Honda. A slam dunk. There are bikes that turn better. There are bikes that go in a straight line better. 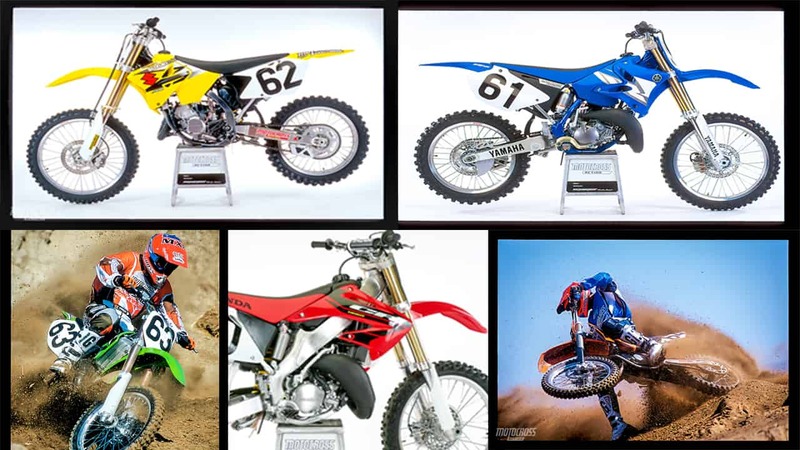 None of them, however, do both as well as the CR125. A: KTM. It has a little headshake, a little understeer and a little Euro feel to it. It’s not bad. It just takes time to adapt to–especially if you are coming off a Japanese-built 125. Test riders loved the KX125 engine, but couldn’t get over how bad the new rear suspension was. Here is a quick thumbnail sketch of what the MXA wrecking crew really thinks about the five 125 two-strokes. KTM 125SX: This bike has the best 125 engine of all-time. It isn’t just fast–it is the fastest. That is something to crow about. The rest of the package (suspension, handling, brakes and ergos) is average at best. Yamaha YZ125: Yamaha’s marketing plan is middle-of-the-road. 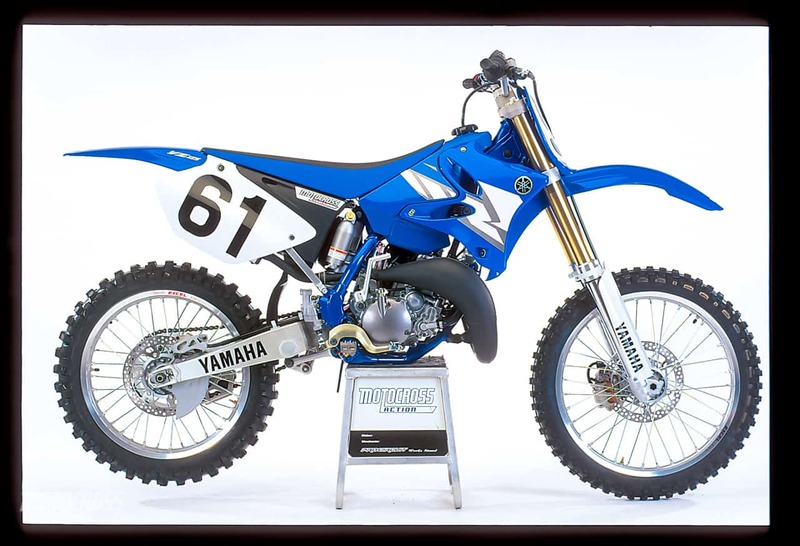 Yamaha has played it safe with the YZ125. The YZ125 has a good engine, good suspension and good ergonomics. It’s just not great. Expect an all-new, risk-taking YZ125 engine in 2005. Suzuki RM125: An absolute blast to ride on tracks that are easy to maintain momentum on. The RM125 has the potential to have great suspension, but only after you’ve dropped a few hundred dollars on stiffer springs (front and rear). Kawasaki KX125: Test riders loved the KX125 engine, but couldn’t get over how bad the new rear suspension was. We are currently testing shock linkages to try and fix it. Honda CR125: This is the bike that coulda, shoulda and woulda won MXA’s 2004 125 two-stroke shootout if only the engine wasn’t such a disappointment. Super light, super agile, super durable and super suspended, it is also super slow. The KTM 125 won the 2004 125 two-stroke shootout due to the powerful engine. A: More than any other class, 125s are all about horsepower. Having an extra horse is a big advantage, two horses is like cheating and three is comparable to Grant Langston signing up to race the 125 Novice class at Chicken Licks Raceway. 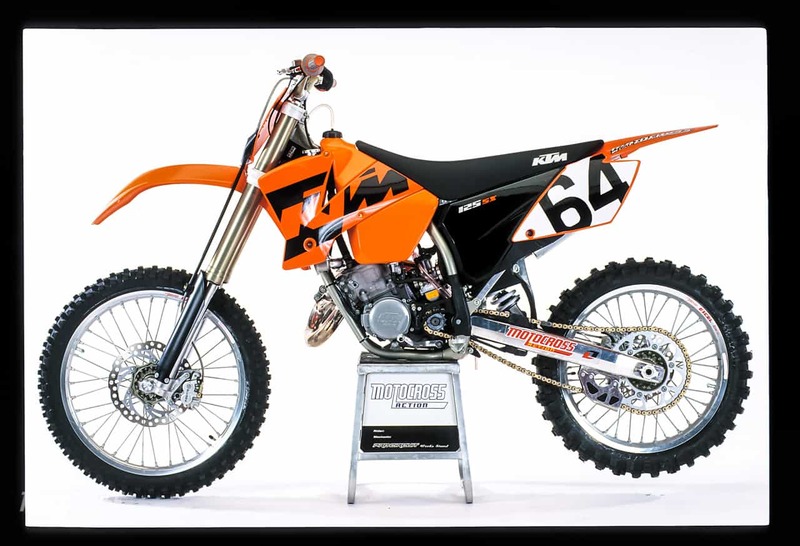 With that said, every MXA test rider chose the 2004 KTM 125SX as the best 125 two-stroke. When it comes to getting to the first turn first, getting out of the corners the quickest, and using the least energy to go fast, the KTM 125SX is hard to beat. True, we valued power over other traits in choosing the KTM 125SX. But, if you think about it, the bike with the best handling, best forks, best bars, best intermediate tires and best shock, the 2004 Honda CR125, couldn’t keep the KTM 125SX in its sight on a track. And that’s why power is king!